The company has said it was a small localised leak and an investigation has now been launched. 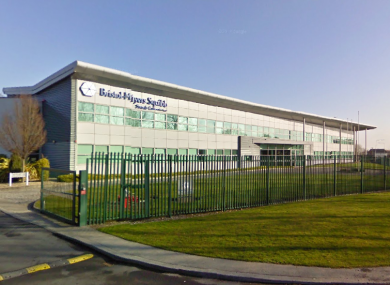 EIGHT EMPLOYEES AT the Bristol-Myers Squibb biopharmaceutical factory in Swords, Dublin, were taken to hospital after a chemical leak at the plant earlier today. The company said in a statement today that the incident, which occurred at 7.30am, was the result of “a small localised chemical leak from a manufacturing vessel”. An on-site emergency response team dealt with the affected workers. Eight staff members presented with “reactionary symptoms” and were taken to Beaumont Hospital. They have all since been discharged. “The employees impacted have been taken care of and no other staff are at risk as a result of the leak,” the company said. A full investigation into the cause of the leak is now underway. The Health and Safety Authority said this evening it had been notified of the incident and is engaging with the company. Email “Eight workers taken to hospital after chemical leak at Dublin plant”. Feedback on “Eight workers taken to hospital after chemical leak at Dublin plant”.